Before I start this column, let me say I am a believer in high performance equipment and tackle. In the world of bass fishing, especially competitive fishing on public lakes, the critical differences in rod actions and sizes as well as the smoothness and lightness of reels all make big differences in catching pressured bass. No doubt about it. However, in the saltwater world, it’s a different story. That’s not to say quality equipment is not important, but rather the premium high-end equipment is simply not a necessity to get in on some great inshore action. In fact, one of the primary aspects of inshore fishing I relish so much is the simplicity of it in terms of equipment and tackle when compared to the complexity of tournament-grade bass fishing gear. Bass fishing has become so technical that most rod and reel combos have a specific job: cranking rods, flipping rods, frogging rods, swimbait rods, topwater rods, drop-shot rods. Trying to use a cranking rod as your flipstick, or frogging rod as your drop-shot rod is going to result in some hurt feelings along the way. So here is the great news about inshore fishing, it’s not nearly as niche specific. In fact, I’m going to go out on a limb here and say a good 7 to 7 1/2-foot spinning rod in a medium action can be used for about 75 percent of the inshore fishing you might encounter. Add in the same length and action casting rod, now you have 95 percent of your bases covered. If you’re looking to acquire some solid inshore outfits to get the job done, here are a few general rules to keep in mind. On the topic of spinning gear versus casting gear, inshore saltwater fishing is usually spinning gear territory. The reason for this is simple: Saltwater fishing typically favors distance over accuracy, while freshwater fishing is more about accuracy over distance. These basic principles are rooted in the notion that freshwater species are usually more cover-oriented and require more accurate casts through and around objects, while inshore species on flats are more open-water oriented and require more distance to reach. A 1/8-ounce jig goes farther into breeze on spinning tackle than on casting tackle – with far fewer backlashes. In addition, with saltwater fishing, especially inshore or nearshore, you don’t necessarily have to immediately power a fish away from abrasive cover, so heavy-action rods are not as mandatory. Also, a lot of saltwater fishing is done with open hooks and saltwater fish are so aggressive, they tend to set the hook themselves as opposed to having to drive a hook through a wad of plastic with a hard hook set. All of this is to help build my case: medium-action spinning tackle covers a lot of territory in inshore fishing. Yes, there are situations like casting spinnerbaits to marsh grass or pitching flood-tide reeds for redfish where more accurate tackle is required, but a medium-action spinning outfit is a standard in the inshore world. 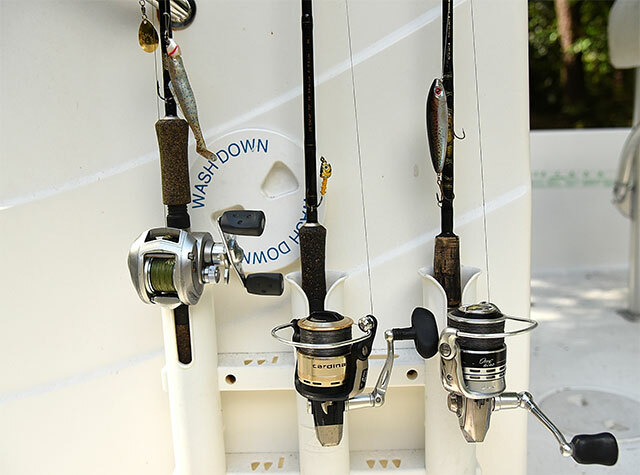 With all of this in mind, I contend with just three moderately-priced rod-and-reel combos – the “Intrepid Trio” as I call it – you are set for a vast majority of inshore fishing. First, start with a couple of 7- to 7 ½-foot medium-action spinning rods, paired with size 2500 or 3000 spinning reels. Spinning reel number designations vary across manufacturers, but common numbers for medium-weight spinning reels for inshore fishing include 2500, 3000 as well as 30 or 40. The numbers will read something like FJ-2500 or SX-40. If the manufacturer sizes the reels with four numerals, look for 2500 or 3000. If they size with two numerals, look for either 30 or 40. Basically, the 2500 and 30 sizes are a little smaller than the 3000 or 40 sizes. Another way to size your reel is by spool capacity. Some manufacturers use a monofilament capacity designation and some use a braid capacity designation. Either way, look for capacity range of 120 to 200 yards of 8-pound-test mono or 15-pound-test braid. Something like a 2500 or 40 size reel that holds about a 150 yards of 15-pound-test braid is perfect. If you feel better with a reel that holds more, like 185 yards of braid, that’s not a problem. But once you get into capacities of 250 yards of 15-pound braid and up on spinning reels, that’s starting to become overkill for inshore fishing. As for the action of the rod, just remember the heavier the action, the more difficult it will be to cast light-weight lures. A lot of retailers sell what are called “surf rods.” These are designed to cast a couple ounces of weight from the beach, not flick a 1/8-ounce jig 100 feet to a wary school of reds.The first rods I took to saltwater were basically 7-foot medium-action shaky-head rods from my bass fishing arsenal, they worked fine. Spool your spinning combos up with some 12- to 16-pound-test braid, depending on the brand you use. I’m still a fan of 14-pound-test Berkley Original Fireline. Remember, the lighter you go, the easier and farther you will be able to cast. Then grab a couple of smaller filler spools of 12- to 16-pound fluorocarbon and monofilament for leaders to match and you are ready for the inshore flats. These two combos will handle everything from weightless fluke-type baits to jigs up to 1ounce, as well as spoons, 4-inch swimbaits and topwaters. Now, for those who want more casting accuracy around heavier cover like marsh grass, oysters bars, rip rap, docks, bridges, seawalls, etc., compliment your two spinning rods with a casting outfit. Just think standard bass casting combo for this outfit: a bass casting reel, 7-foot medium-heavy rod and go a little heavier on the line, maybe 20-pound-test braid with a 17-pound-test leader for spinnerbaits, ½-ounce spoons, buzzing plastics and even hollow-bodied frogs (yes, they catch redfish, too). With the intrepid trio you will have plenty of firepower and versatility to chase nearly everything that swims inshore and on the flats. Trusted names like Abu Garcia, Shimano, Penn and Daiwa all make this kind of gear at various price points. Many of these companies now make “inshore” grade equipment at decent prices, featuring sealed corrosion-resistant ball bearings and aluminum spools made for braid. You can spend as little as $150 to as much as $700 on a single outfit. Again, in my opinion, there is no need to go overboard with inshore equipment. You don’t need a nine-ball-bearing reel and extreme premium-grade graphite to catch inshore fish. I’ve milked $50 spinning reels and $50 rods for years in the salt, bringing home some mighty fine seafood dinners on some pretty modest tackle.